Faye’s Monthly Planet and blog Addiction - have we gone too far? 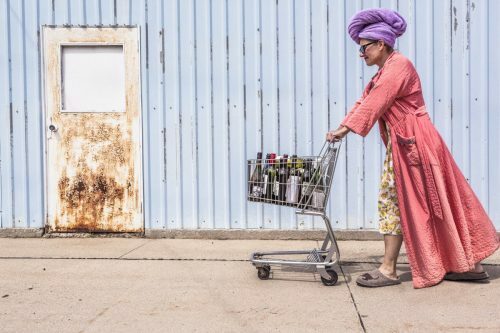 Addiction – have we gone too far? A few weeks ago I attended a lecture by my friend and astrological colleague, Elizabeth Hathway. Her topic was the rare coming together of three entities in May this year – 2009. Chiron, known as a Centaur, is a heavenly body discovered in 1977 which orbits between Saturn and Uranus. Liz specialises in Mundane Astrology, which pertains to anything to do with world events. Perhaps we have gone too far with our efforts to gain wealth, and we must now pay the price. As usual, my way of trying to get a handle on this is to look at cycles and what the planets are up to together. Pisces time is nearly over this year, but we still have to deal with Neptune, the planet that rules Pisces. He is the one associated with areas where we have no borders and boundaries; with addictions and with being either a victim at one end of the scale, or a saviour at the other. These archetypes seem to be being projected onto ‘the people’ as the victim, i.e. all of us suffering from the credit crisis, and Obama, as the one who can save us all. Where there is a victim there must also be a perpetrator of a crime. In this case, this is being projected onto the banks, the directors of banks, the government, and anyone else we can find to blame. As Liz writes, Neptune will soon be joined by Jupiter and Chiron, the wounded healer. I want to look at this cycle from the point of view of Neptune. However firstly it is interesting to note that the present cycle started with another triple conjunction in 1945. This is very rare and will not happen again until we have all passed on to what hopefully is a better place – after the year 3000. The last time it happened was 1881, so it is a very irregular cycle. Although we have lived through a very short cycle from 1945 until now, we are now at the beginning of a rather long one. The effects of these three planets coming together in May will last through until at least 2010, but will set the scene for a long time. So it is important that we plant healthy seeds globally, in business and personally. The commencement of the 1945 cycle saw the start of rebuilding after World War II. The United Nations as well as the International Monetary Fund were set up. The conjunction then took place in the sign of Libra, so the focus was on working together. It was the start of global cooperation, the global dream. As I write I have just heard that the IMF have just announced the first global shrinking since WWII! The end of this cycle has certainly highlighted the truth (Aquarius) about all that sharing (Libra), but at least we are all going down together! Perhaps, as countries, we lost our independence and became too similar. Maybe we were too idealistic about partnership in all senses. Although Chiron tried to heal the massive wounds left by the war, Jupiter made us believe we could all become wealthy entrepreneurs. Bigger was better, adventure and risk were the thing. Travel was the way to go. We believed (Jupiter) in the dream (Neptune) of beauty, harmony and peace (Libra). But although Neptune is very compassionate and creative, he also produces fantasies and illusions. Neptune, in his guise of addictions, is currently passing through Aquarius, so this gives us a clue as to what we might be addicted to since 1998 and until 2011-12. Aquarius shows us the themes we can’t get enough of: computers, technology, designer drugs, science, being right, believing everyone is equal, getting the truth, social networks, being an individual. The longing behind all this, which we somehow believe is unattainable – because this is how Neptune seems to work – is to be authentic. We yearn to be ourselves AND also fit into society. Just when we get that sorted out, Neptune changes his mind and we will all have to have a new dream in 2012, when he finally goes home to his own sign of Pisces. But that’s another story. And now, along comes Jupiter again. Trying to be positive, he again wants us to believe, but in another dream. This Aquarian one. He makes us even more addicted, as Jupiter is never involved in anything small. However, he is also judgemental. Anything that reeks of unfairness is damned. Anything that is not logical and scientific is judged as irresponsible. Anything that can’t be proven, such as astrology, is called a pseudoscience or worse. One must be part of a social network and have lots of ‘friends’, or feel like some sort of pariah. Everyone has rights, including animals (no argument there, but interesting that Darwin – an Aquarian to boot so he’s the flavour of the year – is generating so much fuss again.) We blame drugs and computers for all teenage ills (and many other things). Addiction to substances has never been more prevalent. Perhaps there’s a point to it all. 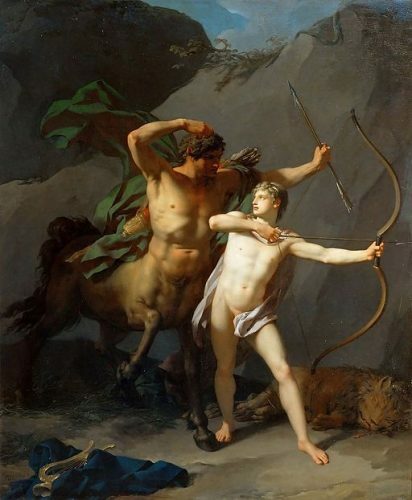 The Education of Achilles by Chiron by Jean-Baptiste Regnault. wikipedia. I think poor old Chiron might have his work cut out, but he is used to that. He had a hard life, being abandoned by his parents, and he had a different lineage from the rest of the centaurs which were half man, half horse. So he was always the outsider. He was an immortal hybrid and became an accomplished healer. He accidentally got injured with a poison arrow by his friend Hercules who was busy assuaging his guilt by doing one of his ’12 Labours’. Even though Chiron told Hercules what to do with the wound, it never healed. The wound was so painful, Chiron eventually gave up his immortality so he could die, by swapping fates with Prometheus. So how could Chiron help us now? Myths are often used to help us to understand particular themes. I read Chiron (and there are many views on this) to mean that if we are wounded, perhaps by a friend, we need to ‘get’ the wound in order to move on to another level. It is a wake-up call. In other words, Chiron is about going from Saturnian, material consciousness where matter, money and the physical rule, to Uranian consciousness. Prometheus represents Uranian ideas. Chiron takes his place in order to move on. We can’t heal a wound at the same level of consciousness at which it occurred. Albert Einstein said “No problem can be solved from the same level of consciousness that created it.” We need to understand, with Chiron in Aquarius, what the wound was in 1945, to enable us to solve the problems we have now. Particularly in the financial world, we can’t stick to the same old solutions. Chiron is a hybrid like Obama – they are both outsiders, both have bridging roles. Both are trying to bring us to Uranian consciousness where we really do treat everyone as an individual, including animals and all life AND where we act as part of the whole. Somehow we need to not only yearn for this, but change our beliefs about it being possible. Uranian consciousness is about creating. What we think, we create. We need to do this at every level of society. With these three Gods in Aquarius, we need to look at our addictions to what we think and believe in and heal the wounds caused by wrong ideas. The idea that everything should be beautiful and peaceful, and that everyone can be rich, might not be entirely correct. It is probably not even what most people want if they are to be true to themselves. Only by seeing our ideas for what they are, can we follow someone like Obama (if he can do it) to the next level. 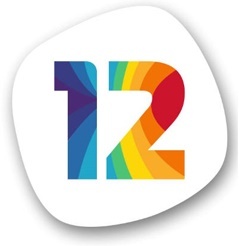 Addiction is usually treated by a 12 step programme. Those steps include admitting our errors, trusting in something larger than ourselves and especially taking responsibility for where we are. The wake-up call might be that by having so much addiction in the world, we cannot avoid seeing it or taking responsibility for it any longer. Hopefully that might pave the way for dealing with other less obvious addictions, like our thoughts. Interesting as this goes to press! 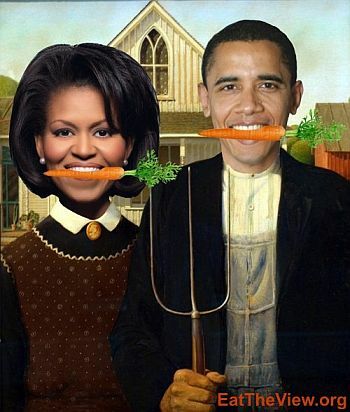 I have just heard that Obama is again planting a vegetable garden at the White House, which was also done during the war. This is to give the people (Moon in the US chart) the example of healthy eating (the Moon is about nurturing) as obesity is a difficult issue in the US. This triple conjunction is exactly on the US chart’s Moon this year, indeed a time for healing of nurturing on all levels and anything associated with women, mothers and children. This website by coach David Kreuger, has many intersting articles. This one is about work addiction and how you can recognise the signs. He also gives tips for remedies. “People who drink to drown their sorrow should be told that sorrow knows how to swim.” Ann Landers, Advice columnist. Will the new Pope Francis win an Oscar?